Emily's Recipes and Reviews | UK Food Blog | Leicestershire : crispy halloumi with mediterranean cous cous. The Tefal Actifry is a nifty kitchen gadget which lets you conjure up culinary delights with just a little cooking oil. The clever air frying technology means you can cook up some mouthwatering chips with a tiny drop of oil, making them a healthier option to deep frying. Although most popular for chip recipes, the recipe booklet shows how you can make the likes of curries, stews, vegetables and even desserts in the Actifry. 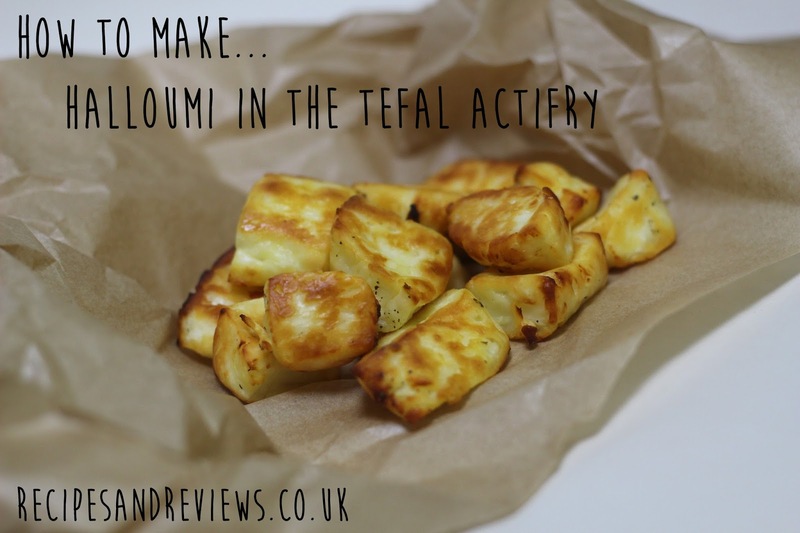 A huge fan of halloumi, it totally made sense to try out a halloumi recipe and I was super pleased with the results. Crispy on the outside and soft within. I mean, it’s still halloumi cheese afterall, but with just a tiny bit of oil means just a tiny bit less guilt. Step one. Boil a kettle and pour hot water over your cous cous until completely covered + 1 cm. Set aside. Step two. Slice your halloumi into generous cubes, being careful not to let it break up. Step three. Add your halloumi to the actifry and drizzle over the oil. Remove the paddle from the Actifry - this is brilliant for rotating chips but the halloumi can break up as it moves round. Turn on and set to 10 minutes. It is ready when crispy and golden brown on the outside. Step four. Your cous cous should now be ready, so stir through the balsamic, olives and tomatoes. Season to taste. Step five. Serve your cous cous with halloumi on top, a scattering of rocket and extra balsamic should you wish. Find out what other Actifry recipes you can conjure up here! The lovely lot at Tefal will be at the Ideal Home Show on (18th March - 3rd April) - and they’ve given me a pair of tickets to give away to my readers. To be in with a chance of winning, answer the question below and enter your details via the Rafflecopter. You can also use the Rafflecopter to generate more entries! Giveaway closes at midday on 28th March to allow to send out the tickets. Good luck! Who or what would you be most looking forward to seeing at the Ideal Home Show? In collaboration with Tefal. Actifry and ticket prize provided by Tefal. Words, recipe and opinion my own. I'd like to look at the Ideal roomsets. Has to be Food & Drink theatre. Get far too excited by kitchen things! I would like to try new foods. I loved the ideal home show last year. I found everyone so welcoming.I loved going round all the different stalls and speaking to all the business people there. there was a great atmosphere at it and I am sure it would be good this year too!!!! I love looking at the new gadgets for around the flat and I desperately NEED a new mop head, which was originally bought for me from the Ideal Home Show! This is a fantastic post you have shared here. I read in detail and got very nice information. Your mentioning steps are very helpful. Thanks a lot. This post is really nice. Crispy halloumi with mediterranean cous is a very nice recipe. Thank for the recipe you share. Can't wait for eat this. It's so yummy.